The arena was opened in 1959 by Vice President Richard Nixon on July 4 and its first event followed four days later, a bantamweight title fight between José Becerra and Alphonse Halimi on July 8. It became a companion facility to the adjacent Los Angeles Memorial Coliseum. The venue was the home court of the Los Angeles Lakers of the NBA from October 1960 to December 1967, the Los Angeles Clippers also of the NBA from 1984 to 1999, and the Los Angeles Kings of the NHL from October to December 1967 during their inaugural 1967–68 season. It was the home for college basketball for the USC Trojans from 1959 to 2006 and the UCLA Bruins from 1959 to 1965 and again as a temporary home in the 2011–2012 season. It also hosted the Los Angeles Aztecs of the NASL played one season of indoor soccer (1980–81), the Los Angeles Blades of the Western Hockey League from 1961 to 1967, the Los Angeles Sharks of the WHA from 1972 to 1974, the Los Angeles Cobras of the AFL in 1988, and the original Los Angeles Stars of the ABA from 1968 to 1970. The arena played host to the top indoor track athletics meet on the West Coast, the annual Los Angeles Invitational track meet (frequently called the "Sunkist Invitational", with title sponsorship by Sunkist Growers, Incorporated), from 1960 until the event's demise in 2004. The arena hosted the 1960 Democratic National Convention, the 1968 and 1972 NCAA Men's Basketball Final Four, the 1992 NCAA Women's Basketball Final Four, the 1963 NBA All-Star Game, and the boxing competitions during the 1984 Summer Olympics. In addition to hosting the final portion of WrestleMania 2 in 1986, the Los Angeles Memorial Sports Arena also hosted WrestleMania VII in 1991 as well as other WWE events. The arena hosted When Worlds Collide, a 1994 joint card between the Mexican lucha libre promotion Asistencia Asesoría y Administración (AAA) and World Championship Wrestling (which normally called the Great Western Forum home until they, too, moved to Staples Center) that is credited with introducing the lucha style to English-speaking audiences in the U.S. NBC's renewed version of American Gladiators and the 1999–2001 syndicated show Battle Dome were filmed from the arena. After then-Clippers owner Donald Sterling turned down an agreement to re-locate the franchise permanently to Anaheim's Arrowhead Pond (now Honda Center) in 1996, the Coliseum Commission had discussions to build an on-site replacement for the Sports Arena. Plans included a seating capacity of 18,000 for basketball, 84 luxury suites, and an on-site practice facility for the Clippers. However, as a new Downtown Los Angeles sports and entertainment arena was being planned and eventually built (Staples Center) two miles north along Figueroa Street, the Coliseum Commission scuttled plans for a Sports Arena replacement, and as a result, the Clippers became one of the original tenants at the new downtown arena. There were also similar plans years earlier, in 1989, as Sterling had discussions with then-Los Angeles mayor Tom Bradley and then-Coliseum Commission president (and eventual Bradley mayoral successor) Richard Riordan about a Sports Arena replacement; Sterling threatened to leave the Sports Arena and move elsewhere in the Los Angeles region if plans did not come together. After the Trojans departed to the new Galen Center in 2006, the arena assumed a lower profile. The arena still continued to hold high school basketball championships, as well as concerts and conventions. The UCLA men's basketball team played a majority of their home games at the Sports Arena during the 2011–12 season while Pauley Pavilion underwent renovation. The Los Angeles Memorial Coliseum Commission embarked on a seismic retrofit[when? ], designed to bring the Sports Arena up to 21st century seismic standards. In order to reinforce the existing 316,700-square-foot (29,420 m2) structure, a series of steel braced frames were connected to the existing concrete structural system at both the arena and loge levels of the building. To provide a solid footing for these steel frames, portions of the arena floor had to be excavated, then reinforced to provide extra strength. Once the steel frames were fitted and incorporated into the existing structure between existing support columns, concrete was then re-poured into the area. The original crown of the arena, one of its most distinguishing characteristics, was the countless small ceramic tiles, each measuring no more than a square inch in width. A multitude of the crown's tiles were loosening and many others were discolored. In order to remedy this, a new crown was designed, this time using individual sections of EIFS (Exterior insulation finishing system), which offered the decided advantages of better durability, easier maintenance and improved thermal characteristics. A foundation surface was applied directly over the existing tiles, in order to seal the crown and give the new surface something to adhere to. Once the structural work was finished, the walls, ceilings, doors, floors and other areas involved in the modification had to be put back together. 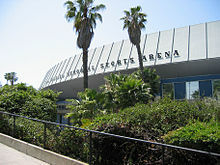 Throughout the entire project, the Los Angeles Memorial Sports Arena remained open for business. The result was a brand-new crown around the exterior of the building, as well as a new terrazzo floor on the concourse level. During an open session meeting on July 17, 2013, the Coliseum Commission authorized the amendment to the existing USC-Coliseum Commission Lease for the operation of the Los Angeles Memorial Coliseum and the then Los Angeles Memorial Sports Arena. On July 25, 2013, the Coliseum Commission and USC executed this new long-term master lease agreement. It became effective on July 29, 2013, and the Commission transferred day-to-day management and financial responsibilities for the Coliseum and Sports Arena to USC. This included the rehiring by USC, on a fixed term basis, of the Coliseum/Sports Arena employees who had been working for the Commission the previous day. For most of the former Coliseum Commission employees, the fixed term of their employment would be short-lived, ending 10 months later on May 30, 2014. The Sports Arena was demolished in order to replace it with a more in-demand facility — a soccer-specific stadium that would house an MLS team. On May 18, 2015, Los Angeles Football Club announced its intentions to build a privately funded 22,000-seat soccer-specific stadium at the site for $250 million. The stadium would be completed by 2018. From March 15 to 19, 2016, Bruce Springsteen performed a series of three sold-out concerts, the last events held in the arena. When he introduced his song "Wrecking Ball" during the last concert, he opened by saying "We gotta play this one for the old building... We're gonna miss this place, it's a great place to play rock 'n' roll." The arena closed after the last concert. Demolition began in September 2016 for the new stadium development. After a groundbreaking for the new stadium, the arena was demolished between August and October 2016. The arena underwent major renovations to bring it up to 21st century seismic standards and was well maintained. There were four fully equipped team rooms, two smaller rooms for officials, and two private dressing rooms for individual performers. There were two additional meeting rooms on site which could be used for administrative or hospitality functions. The floor area comprised a 144-by-262-foot (44 by 80 m) space (38,000 sq ft (3,500 m2)), affording the largest standing floor capacity of any arena in the area. There was a 75-foot (23 m) vertical clearance. The arena has a unique, expansive floor-level footprint of nearly 130,000 sq ft (12,000 m2) and 101,557 square feet (9,435.0 m2) on the concourse level, allowing the installation of any needed display, food or other programming requirements. There was an enormous load-in ramp at the west side of the arena with a 40-foot (12 m) wide entry. Print, radio and television media was serviced on each side of the arena by installation of any kind of portable facilities. Five permanent TV locations were located on the concourse level. In addition, a 6-foot-wide (1.8 m) catwalk was suspended from the ceiling and circled the arena for cameras or spotlights. Spectators could reach arena level seating area either by a circulatory ramp on the southwest side of the building or by a stairway located next to the north doors. There were also escalators located at the southwest and northeast sides of the building. The Sports Arena was the first NBA arena to feature a rotating billboard at courtside, which also acted as the scorer's table. Rotating billboards eventually became standard at all NBA arena until the mid-2000s, when LED billboard/scorer's tables were introduced. Spectator amenities included a full-service main ticket office, a secondary box office and 2 portable booths, 6 permanent concession stands, and a first-aid station. A club and restaurant were located on the arena level of the facility. A number of operational improvements had been made to enhance accessibility for the handicapped, including the installation of 14 additional handicapped parking stalls, hand rails on both sides of the pedestrian ramp leading to the floor level seating, handicapped accessible drinking fountains, an Assistive Listening System to aid the hearing impaired, conversion of restroom facilities, dressing rooms and bathroom fixtures for the handicapped, and increased informational signage. Event presentation was augmented by a four-sided overhead scoreboard with several auxiliary boards. Pink Floyd performed 5 shows at Memorial Sports Arena during their Wish You Were Here tour April 23–27, 1975. They would open The Wall Tour at the same venue February 7–13, 1980 and would perform three more nights in November 1987 on the A Momentary Lapse of Reason Tour. Bruce Springsteen was a popular act at the arena, having played there 35 times between 1980 and 2016. Springsteen humorously referred to the arena as "the dump that jumps" due to its age, poor infrastructure, and its lack of VIP suites, which Springsteen particularly enjoys. Daft Punk performed a sold out show at the Sports Arena on July 21, 2007. Other than Coachella in 2006, this was the only LA-area show of the Alive 2006/2007 tour. The Philippine variety show of ABS-CBN titled ASAP, held an out of town show on October 11, 2014 titled ASAP Live in LA. The heavyweight championship fight scenes between Rocky Balboa and Apollo Creed characters in the 1976 best picture winner Rocky and its first sequel, Rocky II, were filmed at the arena as a stand-in for the Spectrum in Philadelphia. Los Angeles University High School won their 2nd Men's Basketball C.I.F. L.A. City Section Invitational Championship at Memorial Sports Arena in 2008. The arena was the location for a memorial ceremony honoring Gerardo Hernandez, the Transportation Security Administration officer who was killed in the 2013 Los Angeles International Airport shooting. Portions of the 1966 Sci-Fi classic, Fantastic Voyage, were filmed in the interior corridors and parking areas of the arena. Bernie Sanders hosted a campaign rally on August 10, 2015 that was attended by over 27,500 people. ^ L.A. Memorial Sports Arena. Columbia.edu. Retrieved on September 6, 2013. ^ Los Angeles Sports Arena. Basketball.ballparks.com. Retrieved on September 6, 2013. ^ "The Press-Courier - June 26, 1982". The Press-Courier – via Google News Archive Search. ^ 1984 Summer Olympics official report. Archived November 2, 2010, at the Wayback Machine Volume 1. Part 1. pp. 105-7. ^ Baker, Chris; Hernandez, Greg (June 7, 1996). "L.A. Clippers Decide Against Anaheim Move". Los Angeles Times. ^ Springer, Steve (April 17, 1998). "Clippers to Join Kings, Lakers in New Arena". Los Angeles Times. ^ "Clippers' Owner Wants New Stadium". Los Angeles Times. May 11, 1989. ^ "USC takes over control of Los Angeles Memorial Coliseum". ESPN.com. ^ "Los Angeles Football Club's stadium focus firmly on Sports Arena site". Los Angeles Times. March 18, 2015. ^ a b Brown, August (March 20, 2016). "Bruce Springsteen's last stand at the Sports Arena: 'We gotta play this one for the old building'". Los Angeles Times. Retrieved March 22, 2016. ^ "RIP Sports Arena: Aerial Shots Capture Demolished Former Home Of Lakers, Clippers, DNC". CBS Los Angeles. September 14, 2016. Retrieved September 16, 2016. ^ "Knicks Defeat Lakers 111–101". The Milwaukee Journal. October 25, 1960. Retrieved February 16, 2015. ^ Goldfarb, Gerald (December 27, 1986). "Days of Our Lives Has Nothing on the Clippers". Los Angeles Times. Retrieved February 16, 2015. ^ Howard–Cooper, Scott (April 5, 1989). "Celtics Overwhelm the Clippers With Strong Front-Line Play, 124-108". Los Angeles Times. Retrieved February 16, 2015. ^ Howard–Cooper, Scott (January 31, 1990). "Clippers Prove No Panacea for Lakers, 121-104". Los Angeles Times. Retrieved February 16, 2015. ^ Reich, Kenneth (January 4, 1993). "Clippers Up in Air on Site Selection". Los Angeles Times. Retrieved February 16, 2015. ^ Shepard, Eric (January 26, 1994). "Clippers Move Knick Game to Anaheim During Repairs". Los Angeles Times. Retrieved February 16, 2015. ^ Plaschke, Bill (December 14, 1996). "Our Little Secret". Los Angeles Times. Retrieved February 16, 2015. ^ Bolch, Ben (February 25, 2006). "Leaving It On Empty". Los Angeles Times. Retrieved February 16, 2015. ^ Cliff. "Bruce Springsteen – A Good Job in The City (Godfatherecords G.R. 390/391)". Collectors Music Reviews. ^ Mark Willaman. "I've Got a Golden Ticket! – HRmarketer". HRmarketer. ^ Mather, Kate (November 12, 2013). "Slain TSA agent recalled for bravery and valor". Los Angeles Times. Retrieved October 12, 2015. ^ "Sanders West Coast Swing Taps Grassroots Surge". Bernie Sanders. Wikimedia Commons has media related to Los Angeles Memorial Sports Arena.